1 The Integumentary System - What is it? The Integumentary System - What is it? Pronounced in•teg•u•men•ta•ry, this system is colloquially known as the skin and is an organ system which has many functions. This article will hopefully explain the different anatomical layers and physiological functions of the skin and also demonstrate why it is important to have an understanding of the skin with relation to clinical physiotherapy practice. If not working correctly, each of the functions can have important clinical implications and all should be considered when working with patients. For example an important clinical association with the breakdown of the ability of the skin to provide protection is pressure sores. Melanocytes which make up 8% of the cells and are responsible for producing the skin pigment, melanin. As the skin matures, the layers progress to the surface and are a clear, visible example of the effects of cell maturation and aging until they are finally shed. This is deepest layer layer of the epidermis and is made up of a single row of columnar keratinocytes along with melanocytes and markel cells. The basale is the only layer within the epidermis which is able to divide through mitosis. It is the keratinocytes which undergo this mitosis, producing two daughter cells, one of which remains in the basale and the other migrates and matures to the surface progressing through the layers in a process which takes up to 28 days . 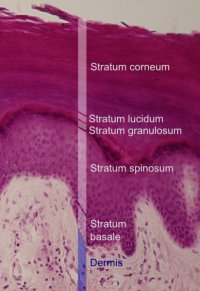 As the stratum basale is the closest layer to the dermis and therefore blood and nutrient supply, as the daughter cells mature and move away from this layer, they recieve less nutrition and subsequnelty die. Additionally the cells become more keratinised as they mature as they accumulate more of the fibrous protein keratin meaning they become more capable of protection as they mature. In healthy skin the balance of cells of formation and matration of cells is in balance . As one of the daughter cells, produced by the stratum basale, mature and progress to this layer they cannot divide and also become rounded and spikier (hence the name spinosum). This layer is 5-12 cells thick and the cells are connected by intercellular bridges called desmosomes and as the cells progress through the layers these connections are continually being broken and reformed . These connections have a thorn like projections which draw cells together, contributing to the tensile strength and elasticity of the skin . After passing through the basale and spinosum, the cells then reach the granulosum. As they progress to this layer they become longer and flattened to form the 3-5 cells thick granulosum. In this layers the cells undergo apoptosis and are unable to form any metabolic function and as the cells lose their nuclues they become keratinised and are completely made of karatin . At the transition between this layer and the stratum corneum, cells secrete lamellar bodies (containing lipids and proteins) into the extracellular space. This results in the formation of the hydrophobic lipid envelope responsible for the skin's barrier properties . This layer is only found on areas of the body which have high levels of wear and pressure and is needed to be thick such as palms and heels. The lucidum is made up of 3-5 layers of clear, dead keratinocytes which are flattened and highly durable and also has a 'glassy' clear appearance . This is the cast off layer as this is the uppermost layer of the skin and consists of 25-30 layers of flat, dead keratinocytes and has a thickness between 10 and 40 μm. These cells are arranged in vertical stacks which are firmly connected to each other by a lipid (sort of cell cement) created in the stratum granulosum . As the cells move through the corneum they become less sticky and are shed in lumps known as squamae in a process known as desquamation . 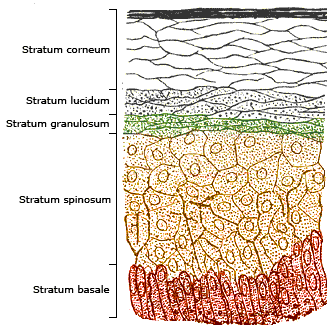 The thickness of the stratum corneum varies throughout the body. In the palms of the hands and the soles of the feet this layer is typically thicker, since these regions require additional protection in order to grasp objects and avoid injury. If the skin is exposed to constant or high levels of friction, then it is the stratum corneum which adapts and forms a hard callus and this demonstrates this layers primary function of protection. The dermis lies beneath the epidermis and above the subcutaneous fat layer and, as mentioned above, is responsible for providing nutrients and blood supply to the epidermis . The dermis contains all of the appendages such as the lymph vessels, nerve endings, hair follicles and glands . The dermis is anchored to the epidermis by rete ridges (furrows) created by hemidesmosomes, which stabilise the surfaces and allow transfer of nutrients between the layers . If there is a shearing force or a high level of friction on these ridges and between the two layers, the two layers may become separated and fluid allowed to collect in the space forming a blister. The dermis is made up of two layers called the reticular and papillary layers. the papillary layer contains nerves and capillaries whilst the reticular layer is comprised of the strong connective tissue collagen. Regeneration-Competent and -Incompetent Murids Differ in Neutrophil Quantity and Function. ↑ 5.0 5.1 5.2 Mclafferty E Hendry C Farley A. The integumentary system: anatomy, physiology and function of skin. Nursing Standard 2010;27:35-42. ↑ 7.0 7.1 Pringle F, Penzer R. Normal Skin: its function and care. In: Penzer, R editor. Nursing Care of the Skin. Oxford: Butterworth Heinemann, 2002. p20-45. ↑ Thibodeau GA, Patton KT. Structure and Function of the Body. 14th ed. Missouri: Mosby. 2012. ↑ Burr S, Penzer R. Promoting Skin Health.Nursing Standard. 2005; 19: 57-65. ↑ Turkington C, Dover JS. Skin Deep. 3rd ed. New York: Checkmark Books. 2007.